Cassava is an easy-to-cultivate and drought-tolerant root crop accounting for much of the calories consumed by approximately 500 million people in tropical and subtropical regions of the world . It is one of the most important staples consumed in Nigeria. However, cyanogenic glycosides (linamarin and lotaustralin) are present in large amounts in all parts of the cassava plant and this often limits its food uses. Cyanogenic glycosides are highly toxic chemicals which can cause severe health problems in humans; the most severe known case being konzo. Traditional processing methods such as peeling, grating, soaking and roasting have been reported to reduce the toxic chemicals to reasonably safe levels. However, following persistent concerns of cyanide toxicity, it is important to adhere to standards and adopt improved methods for managing the hazard since 100 % elimination may not be feasible. 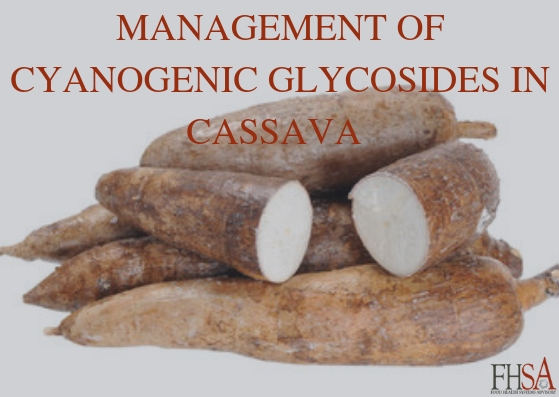 This article outlines some of the standards for cassava-based products and also highlights the improved methods for managing cyanogenic glycosides in cassava.